I think now’s the time for me to take a lover. But today I am a butterfly emerging from his chrysalis. They are gone. Go ahead, run your fingers over the upper half of my body –all bumps you find will be the necessary ones. Hello? No one’s running their fingers over the upper half of my body, much less the lower half. The phrase “take a lover” also conjures visions of me reclining like an odalisque on an overstuffed 19th century chaise longue, resplendent in velvets and feathers. I really think this would be a good look for me. 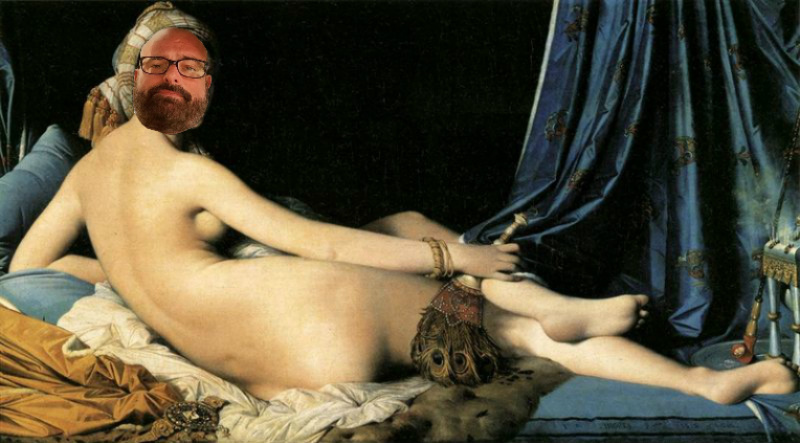 I look great in a La-Z-Boy, and male odalisque is not too much of a stretch after that. Apologies to Jean Auguste Dominique Ingres, 1814. I have other things going for me in the taking a lover department, too, beyond the lack of skin tags. My collection of abstruse t-shirts is at its apogee; I’ve lost like fifteen pounds; I’ve finally figured out a way to apply Just For Men that looks completely natural; I drive a Volvo station wagon that’s old enough to be interesting; and I’m relatively new meat here in Columbus.